Adelaide Chevy Hire is a family owned & operated business with decades of experience in the wedding industry. 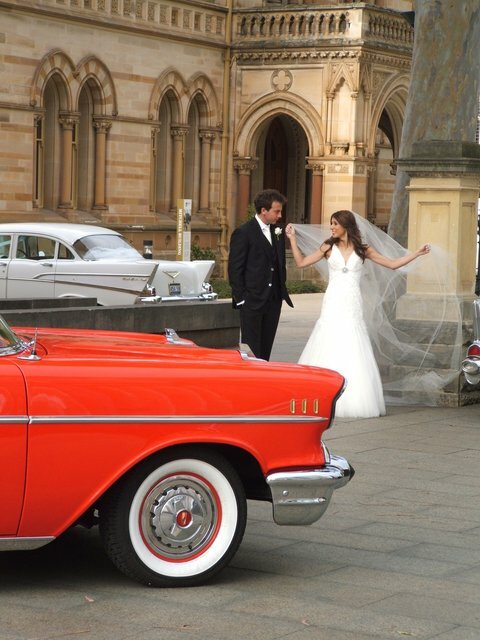 Let Adelaide Chevy Hire turn your special occasion into a memorable one with our immaculate 1957 Chevrolet's! We will transport you in Classic Style & Comfort on your Wedding day for truly an unforgettable experience. Adelaide Chevy Hire offers you Classic Matching White 1957 Sedans, which can seat up to 5 passengers, or why not add some colour to your day with the one and only Matador Red 1957 Convertible and stand out from the crowd to really make an entrance! Our friendly and experienced staff will ensure that all your needs are satisfied on your wedding day. Our sedans are decorated with white ribbons and tulle; we also provide your bridal party with light refreshments and the red carpet for the bride’s grand entrance to the ceremony. You are welcome to view the vehicles and obtain a no obligation quote for your wedding requirements. So feel free to ring and make an appointment.